In 1972, UAAD established an annual award for excellence in management named for UAAD founder Carl A. Donaldson. A graduate of the University of Nebraska, Donaldson devoted his entire 43-year professional career to University service. This award was designed to promote the purposes of UAAD and to recognize University of Nebraska–Lincoln employees who demonstrate outstanding skills in management. Established in 1992 as part of a bequest from a trust established by Floyd S. Oldt, a member of the Nebraska Class of 1920. Oldt was a superintendent of Abel Construction Co. in Lincoln before moving to Dallas, Texas, where he became a prominent general contractor. Oldt was a generous contributor to many humanitarian and civic organizations. The award recognizes employees who demonstrate exceptional service and dedication to the University of Nebraska-Lincoln. UAAD celebrated Founders' Day on March 20, 2019 - its 57th year at Nebraska. Diane Mendenhall, Associate to the Chancellor for External Engagement, provided a keynote address and assisted in presenting the annual Donaldson and Oldt Awards. This year’s recipient for the Carl A. Donaldson Award for Excellence in Management is Rachel Larson, Director of the College of Business Career Center. This year’s recipient for the Floyd S. Oldt Award for Exceptional Service and Dedication is Donelle Moormeier, Business Manager for the newly created Louise Pound Hall Business Coop in the College of Arts & Sciences. 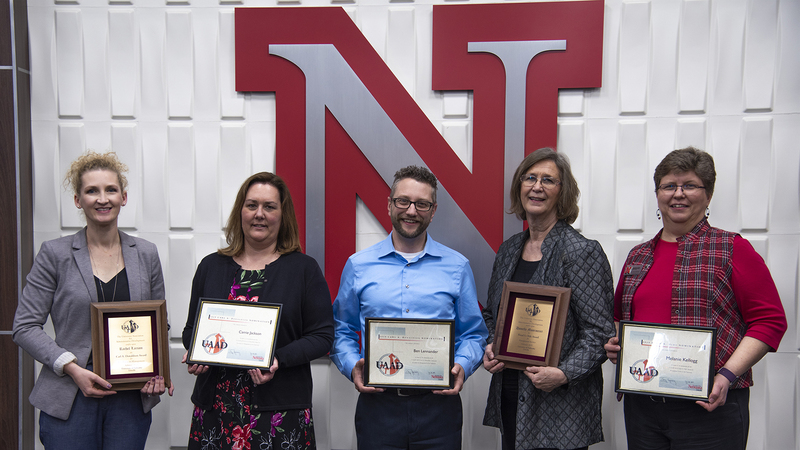 L-to-R: 2019 Carl A. Donaldson Award for Excellence in Management: Rachel Larson (accepted by Celeste Spier); Carrie Jackson (Donaldson nominee); Ben Lennander (Donaldson nominee); 2019 Floyd S. Oldt Award for Exceptional Service and Dedication: Donelle Moormeier; Melanie Kellogg (Oldt nominee). Not pictured: Milunka Brajic (Donaldson nominee); Stephanie Kuenning (Donaldson nominee); Joe Goodwater (Oldt nominee).